Alexander (Aleksandr) II Nikolaevitch (Russian: Александр II Николаевич) (April 17, 1818 – March 13, 1881) was the tsar (emperor) of Russia from March 2, 1855 until his assassination in 1881. He was also the Grand Duke of Finland. Born in 1818, he was the eldest son of Tsar Nicholas I of Russia and Charlotte of Prussia, daughter of Frederick William III of Prussia and Louise of Mecklenburg-Strelitz. His early life gave little indication of his ultimate potential; until the time of his accession in 1855, few imagined that he would be known to posterity as a great reformer. Unfortunately, his reforms did not go far enough in restructuring the political and social life of Russia in order for it to join the rest of Europe in a fully democratic nation. The emancipation of the serfs weakened the aristocracy, the basis of Imperial Russia, without creating the context for a new nation to emerge. Caught midway between the old world and the new, the autocracy would be swept away a generation later by World War I and the Russian Revolution of 1917. During the 30 years in which Alexander was heir apparent, the atmosphere of St. Petersburg was unfavorable to the development of any intellectual or political innovation. Government was based on principles under which all freedom of thought and all private initiative were, as far as possible, suppressed vigorously. Personal and official censorship was widespread; criticism of the authorities was regarded as a serious offence. Under supervision of the liberal poet Vasily Zhukovsky, Alexander received the education commonly given to young Russians of good family at that time: a smattering of a great many subjects and exposure to the chief modern European languages. He took little personal interest in military affairs. To the disappointment of his father, who was passionate about the military, he showed no love of soldiering. Alexander gave evidence of a kind disposition and a tender-heartedness which was considered out of place in one destined to become a military autocrat. Alexander succeeded to the throne upon the death of his father in 1855. The first year of his reign was devoted to the prosecution of the Crimean War, and, after the fall of Sevastopol, to negotiations for peace, led by his trusted counselor Prince Gorchakov. Then he began a period of radical reforms, encouraged by public opinion but carried out with autocratic power. All who had any pretensions to enlightenment declared loudly that the country had been exhausted and humiliated by the war, and that the only way of restoring it to its proper position in Europe was to develop its natural resources and thoroughly to reform all branches of the administration. The government therefore found in the educated classes a new-born public spirit, anxious to assist it in any work of reform that it might think fit to undertake. Fortunately for Russia, the autocratic power was now in the hands of a man who was impressionable enough to be deeply influenced by the spirit of the time, and who had sufficient prudence and practicality to prevent his being carried away by the prevailing excitement into the dangerous region of Utopian dreaming. Unlike some of his predecessors, Alexander had no grand, original schemes of his own to impose by force on unwilling subjects, and no pet projects to lead his judgment astray. He looked instinctively with a suspicious, critical eye upon the solutions which more imaginative and less cautious people recommended. These character traits, together with the peculiar circumstances in which he was placed, determined the part which he would play in bringing the reform aspirations of the educated classes to fruition. However, the growth of a revolutionary movement to the "left" of the educated classes led to an abrupt end to Alexander's changes when he was assassinated by a bomb in 1881. It is interesting to note that after Alexander became tsar in 1855, he maintained a generally liberal course at the helm while providing a target for numerous assassination attempts (in 1866, 1873, and 1880). Though he carefully guarded his autocratic rights and privileges, and obstinately resisted all efforts to push him farther than he felt inclined to go, for several years Alexander acted somewhat like a constitutional sovereign of the continental type. Soon after the conclusion of peace, important changes were made in legislation concerning industry and commerce, and the new freedom thus afforded produced a large number of limited liability companies. At the same time, plans were formed for building a great network of railways—partly for the purpose of developing the natural resources of the country, and partly for the purpose of increasing its power for defense and attack. 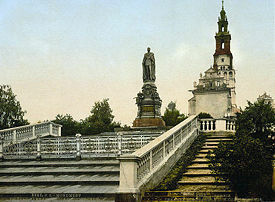 A monument to Alexander II in Jasna Góra Monastery in Częstochowa, Poland. It was found that further progress was blocked by a formidable obstacle: the existence of serfdom. Alexander showed that, unlike his father, he meant to grapple boldly with this difficult and dangerous problem. Taking advantage of a petition presented by the Polish landed proprietors of the Lithuanian provinces, and hoping that their relations with the serfs might be regulated in a fashion more satisfactory for the proprietors, he authorized the formation of committees "for ameliorating the condition of the peasants," and laid down the principles on which the amelioration was to be effected. The deliberations at once raised a host of important, thorny questions. The emancipation was not merely a humanitarian question capable of being solved instantaneously by imperial ukase. It contained very complicated problems, deeply affecting the economic, social, and political future of the nation. Alexander had little of the special knowledge required for dealing successfully with such problems, and he had to restrict himself to choosing between the different measures recommended to him. The main point at issue was whether the serfs should become agricultural laborers dependent economically and administratively on the landlords, or whether they should be transformed into a class of independent communal proprietors. The emperor gave his support to the latter project, and the Russian peasantry became one of the last groups of peasants in Europe to shake off serfdom. The architects of the emancipation manifesto were Alexander's brother, Grand Duke Konstantin Nikolayevich, Yakov Rostovtsev, and Nikolay Milyutin. On March 3, 1861, the sixth anniversary of his accession, the emancipation law was signed and published. Other reforms followed: army and navy re-organization (1874), a new judicial administration based on the French model (1864), a new penal code and a greatly simplified system of civil and criminal procedure, an elaborate scheme of local self-government for the rural districts (1864) and the large towns (1870) with elective assemblies possessing a restricted right of taxation, and a new rural and municipal police under the direction of the Minister of the Interior. Alexander II would be the second monarch to abolish capital punishment, a penalty that is still legal (although not practiced) in Russia. However, the workers wanted better working conditions; national minorities wanted freedom. When radicals began to resort to the formation of secret societies and to revolutionary agitation, Alexander II felt constrained to adopt severe repressive measures. Alexander II resolved to try the effect of some moderate liberal reforms in an attempt to quell the revolutionary agitation, and for this purpose he instituted a ukase for creating special commissions composed of high officials and private personages who should prepare reforms in various branches of the administration. On July 6, 1880, less than a month after Tsarina Maria's death on June 8, Alexander formed a morganatic marriage with his mistress Princess Catherine Dolgoruki, with whom he already had three children. A fourth child would be born to them before his death. George Alexandrovich Romanov Yurievsky (1872-1913). Married Countess Alexandra Zarnekau and had children. They later divorced. Olga Alexandrovna Romanov Yurievsky (1873-1925). Married Count George von Merenberg. Catherine Alexandrovna Romanov Yurievsky (1878-1959). Married first Prince Alexander V. Bariatinsky and second Prince Serge Obolensky, whom she later divorced. At the beginning of his reign, Alexander expressed the famous statement "No dreams" addressed for Poles, populating Congress Poland, Western Ukraine, Lithuania, Livonia, and Belarus. The result was the January Uprising of 1863-1864 that was suppressed after 18 months of fighting. Thousands of Poles were executed and tens of thousands were deported to Siberia. The price for suppression was Russian support for Prussian-united Germany. 20 years later, Germany became the major enemy of Russia on continent. All territories of the former Poland-Lithuania were excluded from liberal policies introduced by Alexander. The martial law in Lithuania, introduced in 1863, lasted for the next 50 years. Native languages such as Lithuanian, Ukrainian, and Belarusian were completely banned from printed texts. The Polish language was banned in both oral and written form from all provinces except Congress Kingdom, where it was allowed in private conversations only. The difference in the treatment given by Alexander to Poland and the Grand Duchy of Finland was extensive. In 1863 Alexander II re-established the Diet of Finland and initiated several reforms that increased Finland's autonomy from Russia, including establishment of Finland’s own currency, the Markka. Liberation of enterprise led to increased foreign investment and industrial development. And finally the elevation of Finnish from a language for simple people to a national language equal to Swedish opened opportunities for a larger proportion of the society. 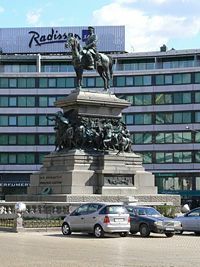 Alexander II is still regarded as "The Good Tsar" in Finland. Alexander's attitude towards Finland should be seen as genuine belief in reforms. It could be that reforms were easier to test in a small, homogeneous country than the whole of Russia. The benevolent treatment of Finland can also be seen as a reward for the loyalty of its relatively western and Swedish-oriented population during the Crimean War and the Polish Uprising. Encouraging Finnish nationalism and language can also be seen as an attempt to weaken ties with Sweden. In 1866 there was an attempt on Alexander’s life in Petersburg by Dmitry Karakozov. To commemorate his narrow escape from death (that he referred to only as "the event of April 4, 1866"), a number of churches and chapels were built in many Russian cities. On the morning of April 20, 1879, Alexander II was walking towards the Square of the Guards Staff and faced Alexander Soloviev, a 33-year-old former student. Having seen a revolver in his hands, the tsar ran away; Soloviev fired five times but missed. He was sentenced to death and hanged on May 28. The student acted of his own accord, but there were many other revolutionaries who were keen to kill Alexander. In December 1879 the Narodnaya Volya (“People's Will”), a radical revolutionary group that hoped to ignite a social revolution, organized an explosion on the railway from Livadia to Moscow, but they missed the tsar's train. Subsequently, on the evening of February 5, 1880, the same revolutionaries set off a charge under the dining room of the Winter Palace, right in the resting room of the guards a story below. The tsar was not harmed, as he was late to the supper. However, the explosion did kill or harm at least 67 other people. The explosion did not destroy the dining room, although the floor was heavily damaged. 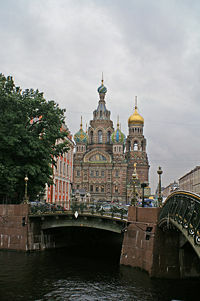 The Church of the Savior on Blood commemorates the spot where Alexander was assassinated. After the last assassination attempt, Michael Tarielovich, Count Loris-Melikov was appointed the head of the Supreme Executive Commission and given extraordinary powers to fight the revolutionaries. Loris-Melikov's proposals called for some form of parliamentary body, and the tsar seemed to agree; these plans were never realized, however, as on March 13, 1881, Alexander fell victim to an assassination plot. While the tsar's carriage traveled along one of the central streets of St. Petersburg, near the Winter Palace, a bomb detonated, injuring several civilians. Accounts claim that when Alexander got out of his bulletproof carriage (a gift from Napoleon III), he was hit by another suicide bomber, mortally wounded by an explosion of hand-made grenades and died a few hours later. Nikolai Kibalchich, Sophia Perovskaya, Nikolai Rysakov, Timofei Mikhailov, and Andrei Zhelyabov were all arrested and sentenced to death. Gesya Gelfman was sent to Siberia. The tsar was killed by Ignacy Hryniewiecki, a Pole from Bobrujsk (modern Babruysk, Belarus), who died as well during the attack. It has been theorized that Hryniewiecki's resolve to assassinate Alexander II was a result of the Russification process, which constituted a complete ban on the Polish language in public places, schools, and offices. Moss, Walter G. Alexander II and His Times: A Narrative History of Russia in the Age of Alexander II, Tolstoy, and Dostoevsky Retrieved May 22, 2007. 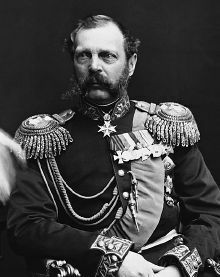 History of "Alexander II of Russia"
This page was last modified on 1 March 2019, at 16:00.